"The Final Fate of Earth 2" - Part Four: "Ultra-Humanity"
Power Girl, Hawkgirl, Fury, Red Tornado, the Flash and Superman are fighting all of the Ultra-Humanite's Sandmen in the heart of Metropolis. This leaves the Huntress, Boy Wonder and Batman to prove they are on Sergeant Steel's side by infiltrating Central Control. The Sandmen are willing to endanger innocent lives who fear the superheroes while the Wonders they combat try to protect them. The army of Sandmen is being depleted permitting the Ultra-Humanite to unleash his ultimate weapon, Alan Scott the Green Lantern. Story - 5: Whether the series is ending or a new creative team will take over after this story arc, reading this made me feel like Dan Abnett wants to leave this comic book with a bang. He's given readers a solid, fast paced, action fest filled with great character moments that could give the best Arnold Schwarzenegger films a run for their money. Art - 4: The change in artists isn't jarring or too obvious as it sometimes can be in the middle of a story arc. Vicente Cifuentes seems to be using a style similar to those who drew this title in the past. The end results are clean, mind-blowing images that work perfectly for this book. Why did I knock a point off? Well, look at Val-Zod's "S" shield throughout this issue. It doesn't look quite right, and it seems to be backwards in one panel. 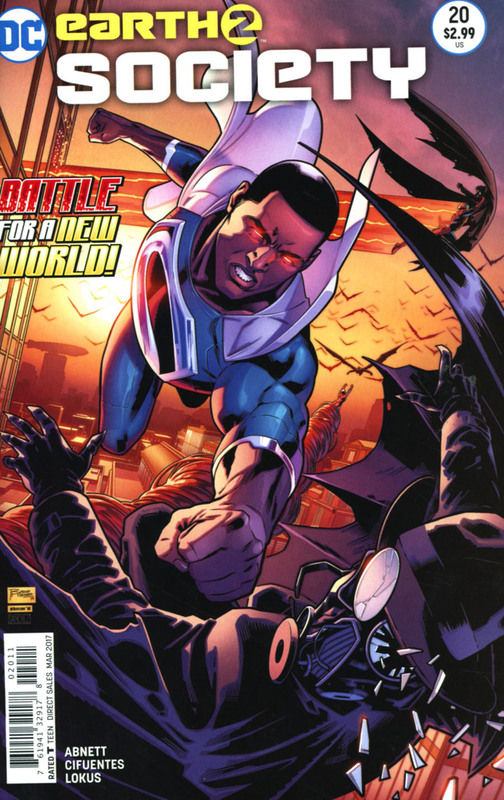 Cover Art - 5: This cover is well drawn and a perfect way to show Val-Zod in action.